The IC-083 is a thermal imaging camera very versatile that can be used in countless applications such as industrial maintenance, energy efficiency, non-destructive controls, medicine and veterinary, security and fire fighting, petrochemical, research, etc. It has a built-in LCD screen which displays the captured images in real time. 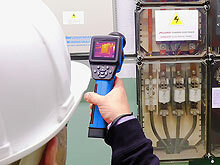 It is the most economical solution for beginners in infrared thermography issues. TEMPERATURE RANGES From -20 to 350ºC approx.